Today, books or shops dealing with tartan and Highland Dress will be mainly, if not exclusively, concerned with clan tartans. 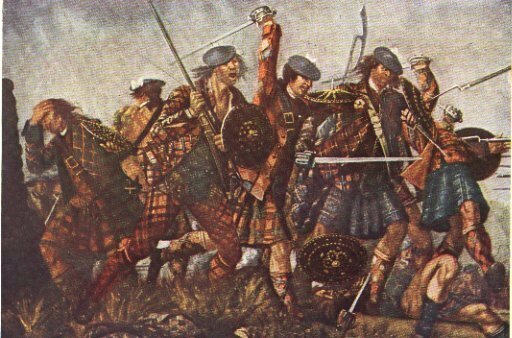 They may seek to suggest that these are the actual patterns worn by the Scottish clans throughout history up to, and including, the Battle of Culloden in 1746. This is not the case. The majority of the pre-1850 patterns bearing clan names can only be traced back to the early 19th century and to the famous weaving firm of William Wilson & Sons of Bannockburn, near Stirling. 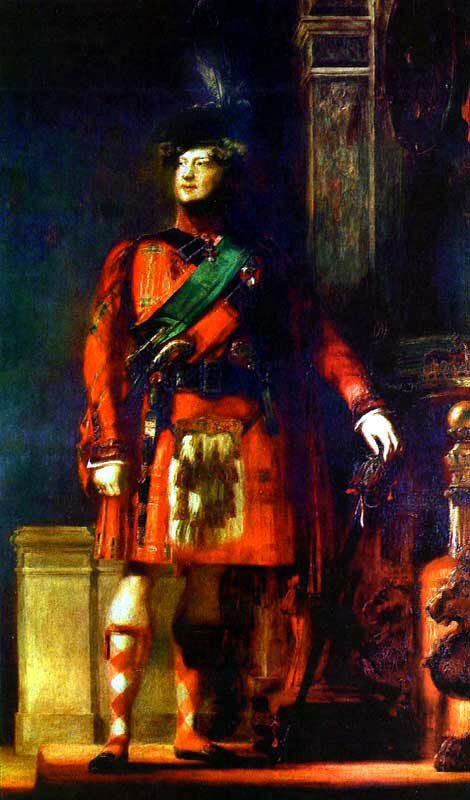 After the failure of the last Jacobite rising in 1746, the kilt and tartan were banned in an attempt to stamp out the culture which was seen by the Hanoverian government as the power base of the House of Stuart. The ban, imposed by an Act of Parliament of 1746, was called the Disarming Act or ‘An Act for the more effectual disarming of the Highlands in Scotland and for more effectual securing of peace of the said Highlands; and for restraining the Use of the Highland Dress’ (19 Geo. II c.39, in Johnston & Robertson, 1899). Under the Act, men and boys were forbidden to ‘wear or put on Highland clothes including; the kilt, plaid and no tartan or party-coloured Plaid or stuff was to be use for Great Coats or for Upper Coats’. The Act, which came into force on August 1st 1747, did not apply to those men serving as soldiers in Highland Regiments, or to Gentry, the sons of Gentry, or women. The proscription of Highland Dress lasted for a period of 36 years before being repealed in 1782, by which time much of the old lore and skills had been lost or discarded as inappropriate to the new politico-economic circumstances in which the Highlanders found themselves. However, under the Act, the ban only affected ‘that part of North Britain called Scotland’ (19 Geo. II c.39, in Johnston & Robertson, 1899) and which was defined in an earlier Act following the 1715 Rising. Roughly speaking, this was the area north of a line from Dumbarton in the west to Perth in the east. Scotland at this time comprised two cultures; the Gaelic Highlands and the Scots Lowlands. The latter was seen by the Hanoverian government as civilised and generally supportive of the crown whereas the Highlands were regarded as a vestige of a wild, untamed, rebellious and Catholic past that needed to be subjugated. William Wilson started his family business south of the Highland boundary in Bannockburn on the outskirts of Stirling where, being unaffected by the Act, he was able to flourish. He quickly cornered the growing market for tartan in southern Scotland and elsewhere, and especially for the lucrative supply of cloth to the military and the increasing number of Highland Regiments. The need for mass cloth production to meet large orders such as the military, led to a requirement for standard colours and patterns in order to maintain quality control. These standardised colours and patterns devised by Wilsons were certainly in use by them by the 1780's and their range continued to grow with the increase in the demand for tartan; a trend which continued throughout the 19th century. By the time the first aniline dye was introduced in 1856 the use of standard colours and colour terminology had been practised by Wilsons for over seventy years and was firmly established. Wilsons started to name some of their patterns after towns and districts in the latter half of the 18th century. Towards the end of the century the use of family names for tartans becomes apparent and this practice increased over the next fifty years and in 1819 they complied their in house reference manual the 1819 Key Pattern Book. In 1778 the Highland Society of London (HSL) was formed as a type of Scottish Gentry’s ex-patriots club in London. In about 1815 Col. Alasdair MacDonnell of Glengarry set about urging the clan Chiefs to submit a piece of their clan tartan, authenticated with their seal, to the collection being made by the HSL. The reasoning behind this idea was to preserve what were assumed to be the ‘original clan patterns’ before they were completely lost. Most of the pieces sealed and deposited with the Society at that time were patterns woven and appear in a majority of cases to have been designed and woven by Wilsons. This obviously means that they could not have existed prior to c.1765 when William Wilson started his business. Sealed sample of Wilsons' Menzies tartan from Highland Society of London's collection. The chief of the Robertsons is said to have travelled around Atholl asking the old men of his clan what the true clan pattern was, but no-one could agree. Eventually he sealed as the true Robertson Tartan a piece of what is now called Hunting Robertson or Robertson of Kindeace, which is thought to be the tartan used for kilts by the Loyal Clan Donnachie (Robertson) Volunteers, a sort of home guard, raised in 1803. Like all such variations of the Government tartan, this pattern cannot be dated earlier than the late 18th Century and so it cannot have been the old Robertson clan tartan. Indeed, there are other old patterns associated with the clan which would have a better claim to being the ‘clan tartan’ had one existed in c.1815. In another example, Duncan MacPherson, the Chief of the MacPhersons, sealed Wilsons ‘No.43, Kidd or Caledonia’ as the MacPherson Tartan. Wilsons had previously sold No.43 or Caledonia to a man on the east coast of Scotland named Kidd and after a while it also begun to be called No.43 or Kidd tartan in their records. They later sold the Kidd tartan to a Mr MacPherson in the West Indies and his name began to be associated with this tartan. It therefore appears that Duncan MacPherson went to Wilsons to find his true tartan and they supplied No.43 as the MacPherson tartan. These examples illustrate the confusion surrounding the naming of tartans at that period and support my argument that the idea of clan tartans took off during the early 19th century. ‘combined to excite much curiosity among all classes, to ascertain the particular tartans and badges they were entitled to wear. This creditable feeling undoubtedly led to a result different from what might have been expected: fanciful varieties of tartan and badges were passed off as genuine’. This tartan fervour was exploited by Wilsons who put on extra looms and widen their range of fancy tartans several of which were subsequently adopted as clan tartans. The quintessential Scottish material also became an international fashion symbol and was widely used in both male and female clothing. 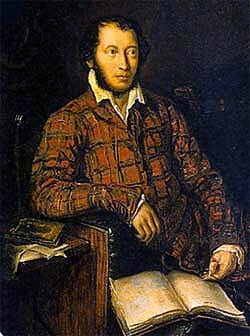 The Russian writer Puskin c1839 and silk dress c1860 show the increasing popularity of tartan outside Scotland. Tartan was given fresh impetus during the reign of Queen Victoria during which time many of the myths surrounding tartan and highland dress began and were codified over the next 100 years. Victoria’s love of all things Scottish is well known and this lead to what has been described as the cult of Balmorality named after her Highland home, Balmoral Castle. Early in her reign two brothers, John Sobieski and Charles Allan Hay, appeared on the Scottish scene. They claimed to be the illegitimate grandsons of Prince Charles Edward Stuart by the Polish Countess Maria Sobieska and later became know as the Sobieski Stuarts. They claimed that they had been left a 16th century document, known as the Douai Mss, giving details of many original but previously unknown clan tartans including those long lost by non-Highland families. Their whole story has now been shown to be a fabrication as has their claimed copy of the Douai Mss which they called the Cromarty Mss. However this did not prevent their designs from being accepted widely as genuine by a society revelling in all things Scottish. That said, their book, the Vestiarum Scoticum, was the first book to be published with tartan plates and this lead to a host of other similar books during the second half of the 19th century.